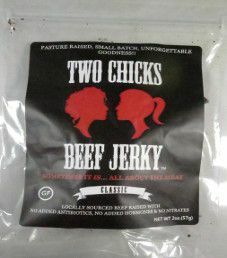 The first review for Two Chicks Beef Jerky will focus on a 2 ounce/57 gram bag of their classic flavored beef jerky. This bag was kindly submitted for review by Breelyn MacDonald, one of the two co-owners of Two Chicks Beef Jerky. This Two Chicks Beef Jerky brand is distributed by Two Chicks Specialty Goods, LLC., based out of San Rafael, California. It all started with Breelyn and her wife Shannon Ronan making homemade jerky for their own consumption. Then they started giving their jerky out to people for constructive criticism, where after a few months, they realized that they had a product worthy of selling. 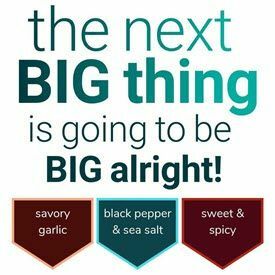 After a 4 1/2 month road trip in the summer of 2012 travelling through 30 states, they received enough positive feedback to convince them to get serious about starting a jerky business. In May 2014, they launched their Two Chicks Beef Jerky brand name, and have not looked back since. The beef used here is sourced from Marin Sun Farms, which is an excellent farm for sourcing beef. Their cattle are ethically raised, meaning the cattle are not administered growth hormones or additional antibiotics. The cattle also have full free range access to graze on grass. The liquid marinade is comprised of just a gluten-free Tamri soy sauce and healthy lemon juice. Lemons are high on vitamin C, and offer many health benefits. 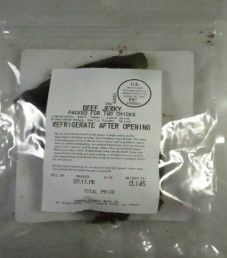 Full credit should be given to Two Chicks Beef Jerky, where all ingredients used in the marinade are certified non-Genetically Modified Organism (GMO) free. For those interested, here is the organic Tamri soy sauce ingredient list: water, organic soybeans, salt, and organic alcohol. Healthy garlic powder and spices are used. Another healthy ingredient used is granulated honey. The quality of honey can vary widely, where local or unpasteurized honey is preferred. There is no nutrition facts table provided. As a result, the exact sugar and salt levels are unknown. Based on the taste alone, this jerky does not seem to be salty or sugary tasting at all. As advertised, this jerky does qualify to have no sodium nitrite, or any other similar unhealthy preservatives. Instead, the main preservative used is salt. Admirably, there is also no MSG added. These strips of jerky are mostly medium in size. The thickness can range from thin to thick. 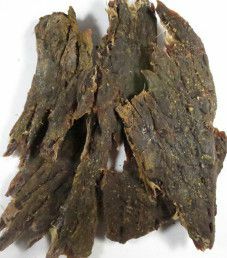 There is a classic dry texture, but not overly dry, which results in jerky that is reasonably easy to chew. There are no signs of fat, and handling this jerky leaves no oily residue on your fingers. The first taste detected is a favorable moderate soy flavor. It does not take long at all for the natural beef flavor to set in, exactly the way a classic flavored beef jerky should be. There is a moderate level of garlic and a mild onion taste. This flavor is only mildly salty, and there is a light peppered taste. A mild tang is noticeable from the lemon juice that improves the overall flavor. With the absence of hardly any sweetness, the natural beef flavor shines through. Overall, a great combination of flavors that manages to capture a classic flavored jerky. A 2 ounce/57 gram bag sells online for $8.00. That works out to $4.00 an ounce, which rates as an expensive price. This jerky is absolutely recommend as worth your money from both a health and taste perspective, where you pay for quality. This is a standard sized, clear, resealable plastic bag. There are labels affixed to both the front and back. 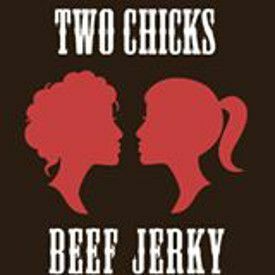 The Two Chicks Beef Jerky logo are silhouettes of two women facing each other. There are several bag categories missing such as a nutrition facts table, a bar code, an allergen alert, and a best before date. There is a great blurb printed on the back of this bag describing Two Chicks Beef Jerky.